Anyone who has viewed our 2 Hands 4 Paws dog massage video interview might be interested in learning specific techniques for massaging their dogs to keep them healthy and free of pain. NOTE: This video series is no longer available. 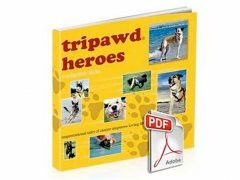 Please search all Tripawds Blogs here for more helpful massage tips. The Dog Massage Secrets Web Video Series from Pawsitive Media is a breakthrough dog massage training course that teaches the therapeutic touch of canine massage with Zoe Gan, a Certified Dog Massage Therapist. Zoe has put all of her dog massage experience, techniques, tips and tricks into 7 concise yet comprehensive online video lessons for you to learn this holistic art in the fastest and easiest manner possible. The Dog Massage Secrets Web Video Lessons are delivered in the latest professional web video method (unlike other amateurish YouTube style videos). This means you can download complete professional lessons and view them immediately, as many times as you like. In less than 60 minutes, you can start massaging your dog the proper way, and start him or her on a lifelong journey of therapeutic and healing wonders. Dog Massage Secrets Web Video Series is filled with step-by-step guide and comprehensive information on the ABCs of dog massage. You’ll learn when to massage your dog, and when not to. You’ll also learn how to set up the proper environment to conduct your dog massage in addition to the massage techniques and sequence. You can complete all lessons in less than 60 minutes, and immediately be able to put into practice what you’ve learned by giving your dog a therapeutic dog massage! NOTE: Read complete chapter descriptions here. Dog massage is a wonderful natural therapy but regular dog massage sessions with a qualified professional dog massage therapist can be very expensive. Instead of paying a monthly fee to a qualified therapist, why not learn the art of dog massage in the comfort of your home and let your dog benefit from regular dog massages for the rest of his or her entire life? Dog Massage Secrets Web Video Lessons by Pawsitive Media is the easiest way to learn dog massage in a quick, concise training course. 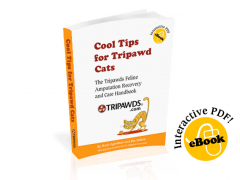 All seven lessons are available for immediate download and come with a 100% Risk-Free Guarantee. ACT NOW to take advantage of special introductory pricing and get all these vital bonuses ABSOLUTELY FREE to help you speed up your learning! Download Dog Massage Secrets Web Video Lessons today and give your dog the massage he/she deserves for the rest of his/her life. Learning dog massage has never been any easier – learn professional techniques in less than 60 minutes. Stop spending hundreds of dollars on dog massage therapists – now you can do it yourself!